The Sonicare Essence toothbrush is the entry-level rechargeable model in the Sonicare range, with a NiCad battery and a stand that doubles as the charging station. This is the next step up from the Sonicare PowerUp, which uses 2 disposable AA batteries instead of being rechargeable. While the PowerUp is a good basic brush, you DO have to replace those AA batteries every few weeks. With the Sonicare Essence, the built-in rechargeable batteries can hold a charge for TWO weeks use, which is remarkable. It makes this brush very handy if you are travelling - you can leave the charger at home! The Essence is a step up from the PowerUp in a couple of other areas, too: the Essence has a visible gauge to show how much charge the battery is holding. This is very useful, as you can see quickly and easily if the brush needs recharging! It also has the 2 minute timer, (called Smart Timer), and the Easy Start software. The Smart Timer lets you know when the brush has been running for 2 minutes. Apparently, surveys of dentists in the U.S.A. show that 2 minutes is the most-often recommended minimum brushing time. Personally, I think that 2 minutes is too short; I recommend AT LEAST double that time! The Easy Start software is a clever way of introducing first-time Sonicare users to the new sensation that you get with Sonicare brushes. This lets a first-time Sonicare user start off on a lower power setting. The Easy Start software then automatically increases the power slightly over each of the next 13 uses, until reaching Full Power on the 12th use. GET YOUR SONICARE ESSENCE AT THE BEST PRICE BY CLICKING ON THE LINK! Phillips have built this feature into the Sonicare range because the sensation you get the first time you use one is very different to a normal electric toothbrush. The brush head works at a much higher rate, which Phillips say is more effective at removing plaque, even in areas not actually touched by the bristle tips! Both use the "e-series" screw-on brush heads. (The Mini heads are good). The "e-series" screw-on brush heads take a little longer to change over than the newer ProResults heads on the more expensive Sonicare brushes. They are also slightly more expensive, but not by much! I'm not too sure about the Smart Timer feature, as I think that the timings they use are too short. I would always advise patients to aim for 6 - 8 minutes of brushing, carefully going around the gum edges of all their teeth. I ALWAYS recommend getting the Mini size replacement brush heads - if you can get them - (every 3 months). This is because the bristles become worn out over time, and also harbor bacteria. YUK! The bristles may LOOK OK, but after a coule of months they lose their elasticity and just don't work as well as they should. So replacing the brush head every 3 months is definitely recommended. 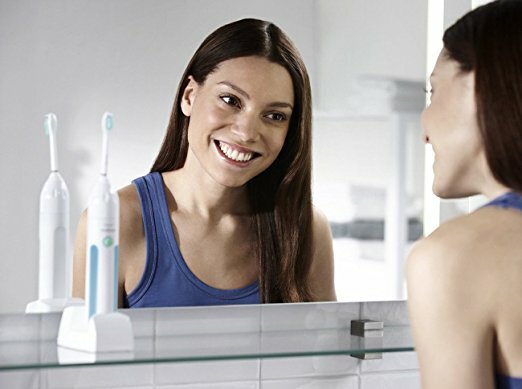 The Sonicare Essence offers the basic Sonicare experience WITH a rechargeable battery and charging station, which is the main difference to the PowerUp. I think it's a great sonic toothbrush at a great price, and I recommend it - it's a good choice!